One of the important elements of this so called "Asylum" were the Wired Strings that along with Serge, Jim Abbiss brought an additional element to this record. Rosie Danvers, the creator of this project will bellow explain us a little more about their contribution to this excellent piece of work. By reading the full interview you will also reach the answer to the challenge presented on the part I of this work. P.s. The above photos were taken from the Wired Strings website (see link bellow for further information) and all the credits belong to the individuals or companies mentioned there. Rosie, I believe this was the first time Wired Strings worked with Kasabian. Did the band contacted you or was through the producer? I was contacted by Jim Abbis, the producer. We had worked on Adele’s debut album ‘19’, together. What is basically the art of strings arrangements? In this case Serge wrote four string sections and you arranged them, right? How does the process works? Do you have access to the whole track or work only mainly on the string section? I would never profess to know what the art of string arrangements is. As an arranger, I feel like an additional member of the band, I am another instrument. I always enjoy the challenge of adding an emotional element to a song that wasn’t there before. In this case, I was sent the tracks prior to the session and proceeded to score out string ideas for each track. Serge knew where he wanted strings in each song, but many of the string lines you hear on the album, were born out of the quartet’s improvisation during the session. We were given direction by Serge and Jim, and then improvised ideas and picked out lines until Jim and Serge were happy with what they were hearing. It’s a very organic process working in this way and really creative for everyone involved. The lines were not written by one person, they were a product of everyone’s input. We were all writers and arrangers that day. On recording – you where at London for that purpose – All the strings were recorded separately from the rest of the instruments right? When recording the performers hear the rest of the track as guidance or is not usual? 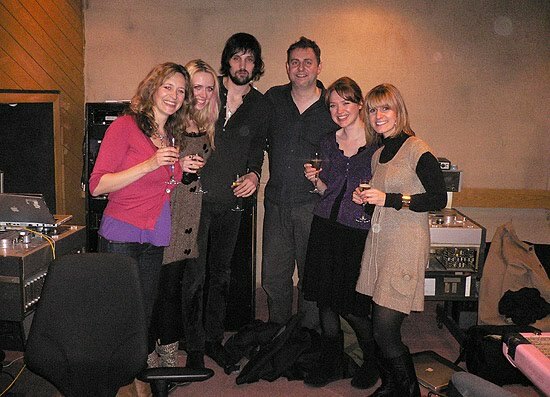 The string session took place at Mayfair studios in London.. The tracks had already been recorded and we used these for guidance throughout the session. From the four tracks what was the one that “pushed you to the limit” from the arrangement side and from the performer one. My Guess is track #2 “Where did all the love go?” with the all the strings section following the grooves and moves of the track. Yes, ‘Where did all the Love Go’ was the most challenging, partly because Serge had asked me to score out his guitar solo and we then had to replicate it, which was great fun! I believe you have recorded them in February 2008. Since the record was released this summer does that cause you any kind of anxiety expecting the “child to born “ and hear the final results? No, anxiety doesn’t come into it! It was a very enjoyable session and I was really proud of everything we had contributed that day. Our ideas were strong and the quartet sounded great. Serge and Jim were very easy to work with.. It all felt a bit like an experiment that turned out well. After a session I let go and move on to the next project. What will be, will be. You’ve started this project back in 1995. What moved you in order to create this great project? I felt there was a need within the industry for a string section that could bridge the gap between classical and pop musicians and work directly with artists and producers. Over time, this has since grown into a symphony orchestra, and enables us to utilise all the instruments of the orchestra within a pop and hip hop context. Quoting your website: “STYLE and individuality play a big part in Wired Strings”. Being so, this is one of the major reasons why Wired Strings perform for many musicians from rock to Hip-Hop (since it’s also very important for the live side on this kind of performances)? I think image is an important part of live performance. When I go to a concert, the visual elements of it are very important to me. I hope that Wired Strings enthusiasm and passion for what we do, is conveyed in our performance. What are the Wired Strings next projects? Any new experience in the near future? I never talk about future project before they happen!